Well, color me pink but I am really upset with this country’s # 27th charity. It appears I’m not alone. For that matter, neither is Joe Waters. And if Joe isn’t alone, neither is Scott Henderson. You see, it was through Joe’s & Scott’s blogs that I first found out about the KFC & Susan G. Komen cause-marketing partnership. And now… we’re not alone >>> the mainstream media has caught on. Check out this CNN article discussing “activists calling foul” (annoying pun, yes) about KFC’s Buckets for the Cure. 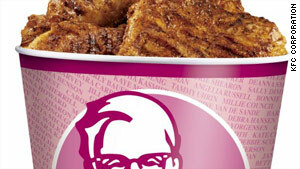 If you haven’t heard – KFC is going to donate 50 cents for every pink bucket they sell. As of the time I write this article, they’ve raised nearly $2.4 million according to the microsite. Good for breast cancer research. Bad for Komen’s brand and for KFC, too. I fear that Komen may have “jumped the shark.” For me at least. I’m not going to rehash Joe’s and Scott’s blog posts that elegantly outline why this campaign is a bad idea. Both articles do an excellent job of describing the dissonance between the caloric intake of a bucket of fried chicken (2400 calories & 160 g of fat), KFC’s new calorie- & fat-laden double down sandwich (540 calories and nearly 1,400 grams of sodium) and the health consequences (specifically related to cancer) of a diet high in fat. I will however talk about what could have been. The program itself is brilliant. Take a visit at the site – you’ll find great information about breast cancer and great stories. The virtual pink bucket has user-submitted true-life stories of survivors and memorials. And if KFC is right, the program will yield the highest single-donation to Komen in history. However, swing and a miss for KFC! Another swing and a miss for Komen! But instead, they went the easy route. It was just too tempting to go with the bucket, knowing that it would be a big seller. And that’s why I disappointed in both parties. KFC is to blame, for sure. But they’re “just a company” to quote a sentiment. But Komen… as the one of the nation’s top charities, one of the most recognizable brands out there (including for-profit brands), and as a leader in cause-marketing… well, frankly, you should know better. I hate to say it, but shame on you Komen. Ugh… I feel like a grandfather. Someone needs to tell Komen that, you know, it’s okay to say no. It will be a great day for breast cancer research when and if KFC meets or exceeds its sales goals that will possibly raise over $8 million for this very important cause. I, however, won’t be celebrating. The author is the president of Do Well Do Good – a CSR & philanthropy consulting firm based in Chicago. (c) 2010. Great summary and way to dig a little deeper on what could have or should been. It was such a whiff on both parties. Your idea re: a healthier food option…a breast, for God’s sake…should’ve been the first idea out of the KFC/Komen marketing machines. A bucket of chicken, really? A total disconnect. That’s why they’re getting flamed. For being out of touch and insensitive. Just a really stupid idea — that, despite it all, will probably more than achieve its objective of big $. So…they’ll feel like all is justified. But to the Komen/Breaded Fat relationships to come…think a little more on the next one. You can make cause marketing more than a cash grab with a little imagination. The other point you miss. Komen’s continued shoveling of funds over to Planned Parenthood; the world’s largest provider of abortions. That fact alone represents the “biggest miss” for Komen. Disgusting how it can support killing of pre-born babies.